So what is toner power composed of? The main ingredient of toner is a polymer or plastic that is transferred to the page when it is melted by the fuser, which is the heating element of a laser printer. The type of polymer used will often vary based on the manufacturer. For example, HP toner is made with a styrene acrylate copolymer, while other manufacturers use polyester resin or other materials. Low-quality polymers can be a big factor in toner cartridges that don’t perform as well as others. The polymer generally makes up about 60% of the mass of the toner powder. Another important ingredient is iron oxide. The roller in a laser printer is magnetically-charged, and the iron oxide is what draws the toner powder toward the charged portions of the roller before it is transferred to the page. The iron oxide accounts for around 40% of the mass of the powder. Toner wouldn’t be useful without color, so the next ingredient is a pigment agent, which gives the toner powder its distinctive color. 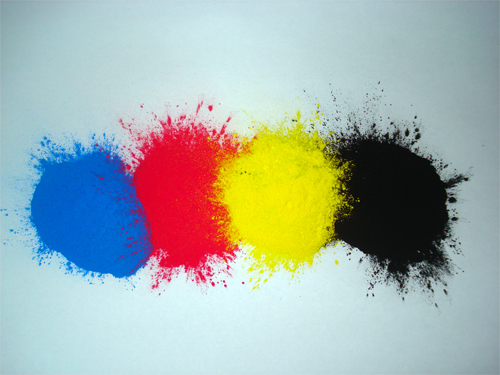 The standard colors for a laser printer are cyan, magenta, yellow, and black, and the pigment is what makes each color of powder distinctive. There are other minor ingredients used in some toner powder, such as wax and sand, which help to give the powder the proper structure or texture. These materials can vary by manufacturer. The ingredients are together mixed together in a batch, which is then broken up into powder. The downside to this method is that the particles are often somewhat uneven. New technologies allow manufacturers to produce particles that are more uniform through a chemical process, so that they can be used more efficiently and in smaller amounts, resulting in higher quality prints. Using high-quality toner powder is essential to getting the best prints, which is why it is advisable to avoid refilling toner cartridges and instead choose remanufactured toner cartridges, which undergo thorough testing to ensure the best quality. With a little more knowledge of how toner powder is produced, you may have a little more appreciation for your laser printer, and the number of technologies and manufacturing processes that were required to provide you with your printed pages.